Opel Antara is a quite new and maybe unknown car in our lands. 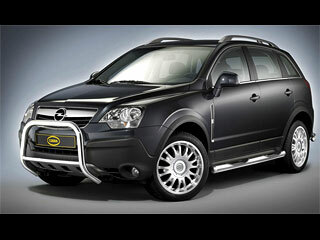 Opel has decided to be a member of SUV segment after many years. Antara is a successor of legendary Frontera and has 4x4 drive. It’s a vehicle particularly for every-day use, so Cobra Technologie & Lifestyle choose it and brings more self-confidence and glamour. This company likes to tune especially SUVs and CUVs, but there are few exceptions too. The first one includes a 60mm chromed pipe frame over the whole bumper. 80mm pipe is installed under the side steps. The second option is a smaller 48mm chromed pipe under the front bumper for safety of pedestrians (Cobra CITYGUARD®) and decent chromed step. Both side steps has integrated stairs for easier entering and exiting. The rear part is same in case of both options. There are new side chromed safety bars and chromed exhaust tip too. But that’s not all. Also the chassis (or the rear part of engine) is protected with a cover. This cover is very useful in hard terrain conditions and it’s a obvious part of every bigger or smaller off-road. Every tuning needs to show some new wheels. This car has sportier 18“ multi-part alloys Cobra Sahara. Cobra Technologie & Lifestyle tuning gives you 24 months of warranty without any mileage limit. This whole modification brings Antara near to more luxurious SUV vehicles. It’s just up to you if you’ll be satisfied with this work of Cobra Technologie & Lifestyle. 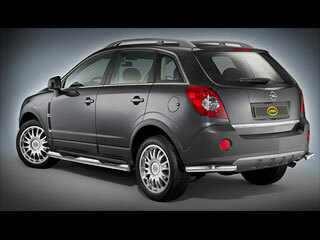 What is your opinion on Opel Antara Cobra Technologie & Lifestyle ?